John Shanahan was born and raised in Cork. 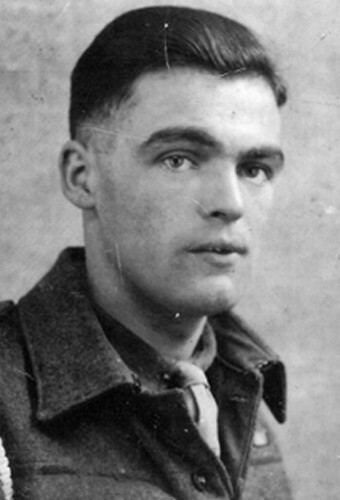 As a citizen of the Irish Republic, John was under no obligation to take part in the war. 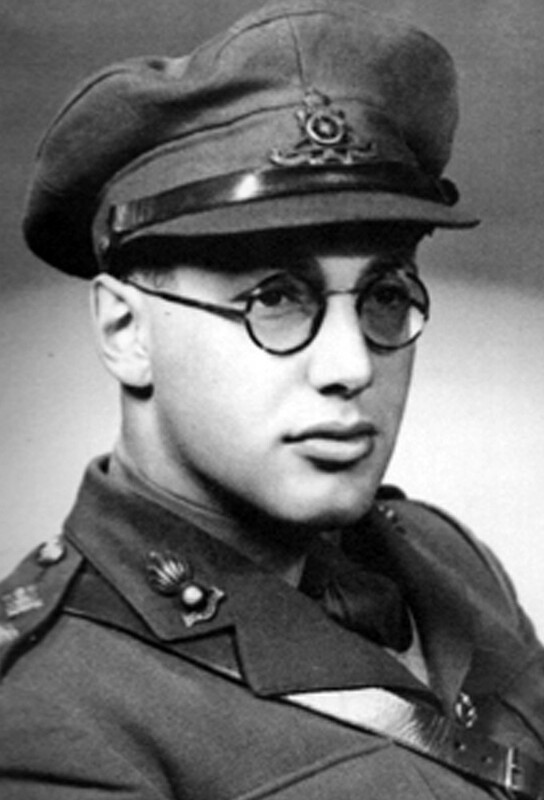 Nevertheless, in August 1941 at the age of 20 he made his way North and crossed the nearest border with Ulster at Newry. 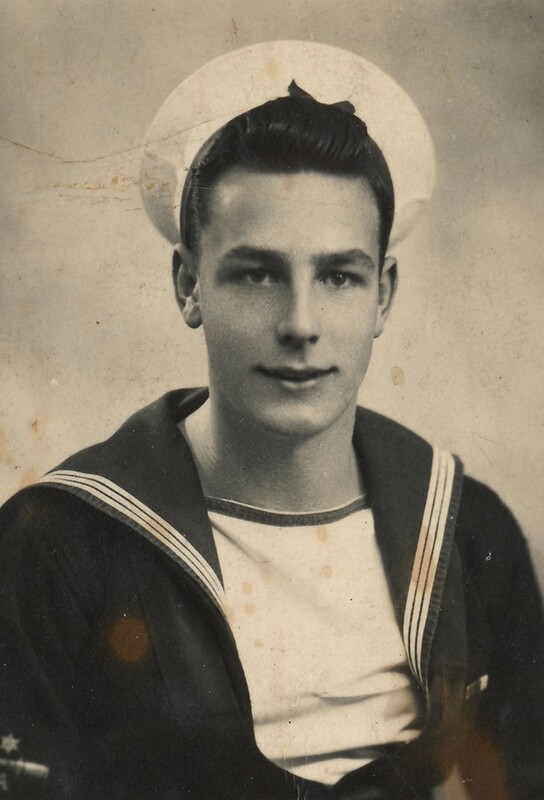 Once volunteered, John was enlisted into the Pioneer Corps, transferred to Belfast, then by ship from Larne to Scotland and onwards to Huyton in North Liverpool. 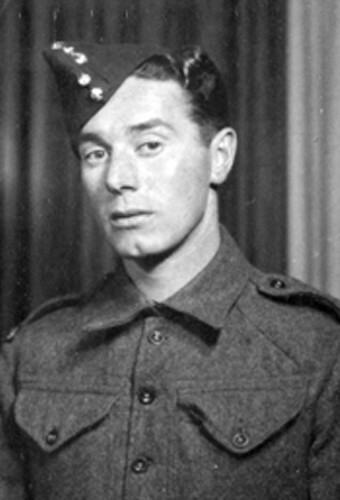 After spending several months in Luton defending munitions facilities, John was ironically transferred to the Royal Irish Fusiliers Regiment and sent back to Ireland for training in Omagh. 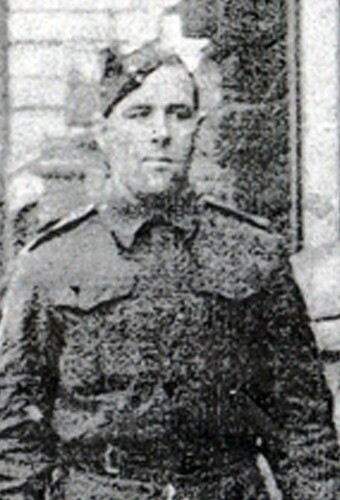 After preparations to be sent to Crete, John’s uniform changed again as he was transferred to the Royal Ulster Rifles. By this time training for the Second Front had begun in earnest, with the ‘Rifles’ now based in Norfolk. Although many troops were sent to Scotland to take part in practice landings, John’s Brigade carried out mock street fighting in the heavily bombed dockland areas of Hull. Residents had been moved away and the bombed out streets became an ideal training ground for the sort of urban warfare which was anticipated throughout the campaign through Northern Europe. As D-Day approached the Royal Ulster Rifles were moved to the south coast of England where they boarded one of the Liberty Ships in Southampton. The Regiment was separated into three Brigades, each taking part in consecutive landings. 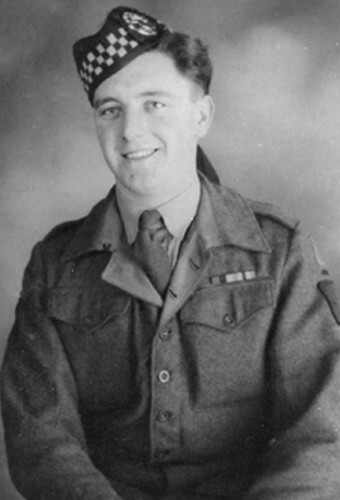 John was to land in France in the second wave on D-Day 6th June. “We were transferred from the Liberty Ship onto small landing crafts; this was about 4 miles offshore. We hit Sword beach just after 0900; actually we landed in about 4 feet of water. I remember my big concern was not to get my rifle wet! The landing area was heavily defended and we met mortar and heavy gun fire… of course there were some soldiers who didn’t manage to get as far as the beach. Once ashore, our battleships continued their heavy bombardment inland. Although we met strong resistance, we had to be careful not to advance too fast and overtake their reach. The funny thing I remember is that many of us had been issued with fold-up bicycles. I’ve often thought this must have been some sort of psychological trick to make us believe we could just walk up the beach and cycle over to Caen. Once we got off the beach there was a big pile of these bikes at the side of the road; it was obvious we wouldn’t be cycling anywhere! A few weeks after landing John had cause to return to the beachhead and was amazed at the massive infrastructure which had developed in the aftermath of those early days of the first landings. The Mulberry Harbour was in place and there was a vibrant but organised scene of intense activity with ships, troops, tanks and armoured vehicles everywhere. 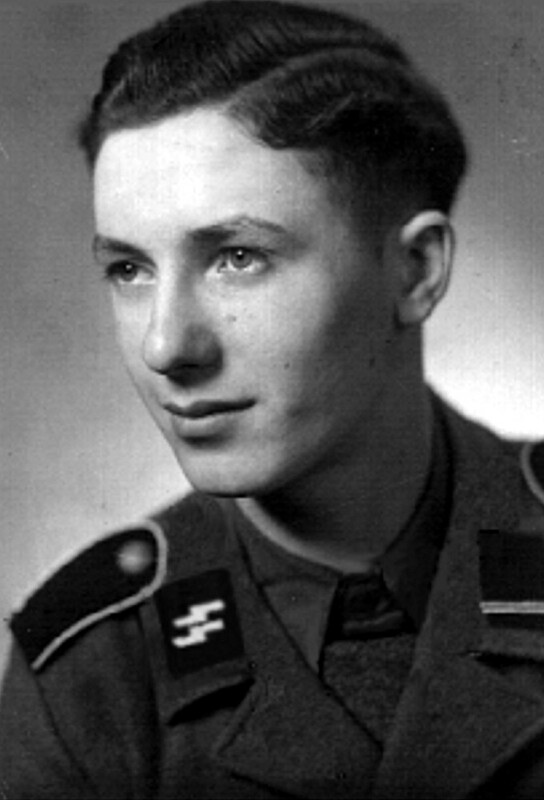 John stayed with the same platoon of 15 men for the next few months as progress was made steadily Eastwards. New men came along as replacements when casualties were sent back. “All the objectives had been given codenames. Everything was wrapped in secrecy and we didn’t know the real place names just in case we were captured and interrogated. Caen was given the codename of ‘Poland’. So if I’d been captured and questioned I could only have revealed that I was on my way to Poland! I particularly remember going out on a ‘fighting patrol’ one time. The ‘recce’ patrols were just to check out the lie of the land ahead, but a ‘fighting patrol’ was aimed at engaging the enemy for the purposes of gathering information. On this occasion we were sent out to capture a German sentry who’s been seen patrolling a roadway ahead of us. My job was ‘tapeman’ I had this great big roll of white tape wrapped around a pick-axe handle and I was to roll it out on the ground to mark our way back. You know, at this stage everyone was a bit trigger happy so you didn’t want to be returning to your own lines at a point where you weren’t expected! We formed a secure line as four NCOs went forward to capture this lone sentry. After what seemed like hours they returned empty handed no sentry had appeared. The order was given to retreat, with me bringing up the rear of course, trying to roll up the damn tape. Well the patrol hurried back to our lines and I was doing my best to gather up this white tape onto the axe handle. Of course the tape kept getting tangled in bushes and stuck on every little twig. As the others disappeared ahead of me I was all too aware that I was now more likely to be shot by my own side than by the enemy! Thankfully, the NCOs stopped just ahead of me in the woodland and all was well. It was about 4 months after the landings when the Royal Ulster Rifles were in support of what was to be the big advance at Arnhem. This was the plan to use paratroops to capture the town and secure the bridges across the Rhine. The plan failed, and in the course of supporting action John was caught in a mine blast triggered by a heavy tank acting in support of the infantry. 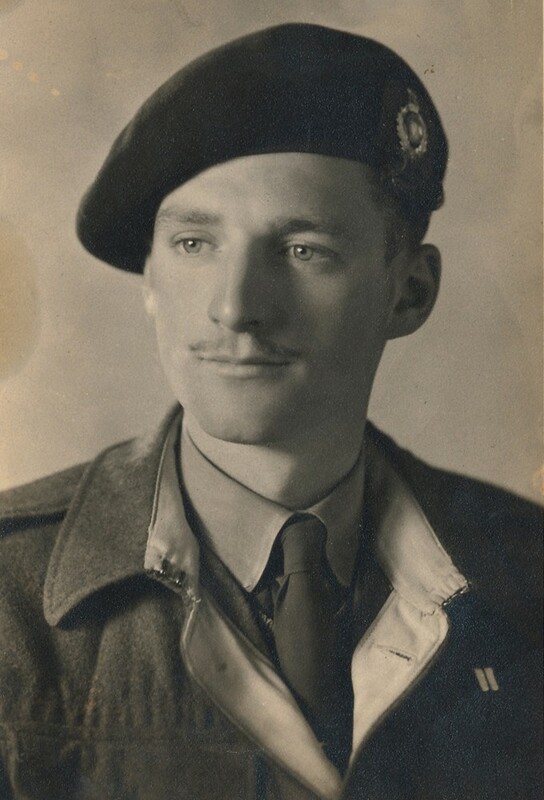 John was blinded by the blast and evacuated back to ‘Blighty’ through Nijmegen & Brussels. Thankfully after hospital treatment in South Shields, John’s sight recovered. Having convalesced in Scarborough, John was sent to Southend-on-Sea and resumed training in a holding unit. He was sent out to Italy and was based in Naples for about 9 months as part of the army of occupation. These were good times, comparatively speaking, and some men signed on for another 3 years. 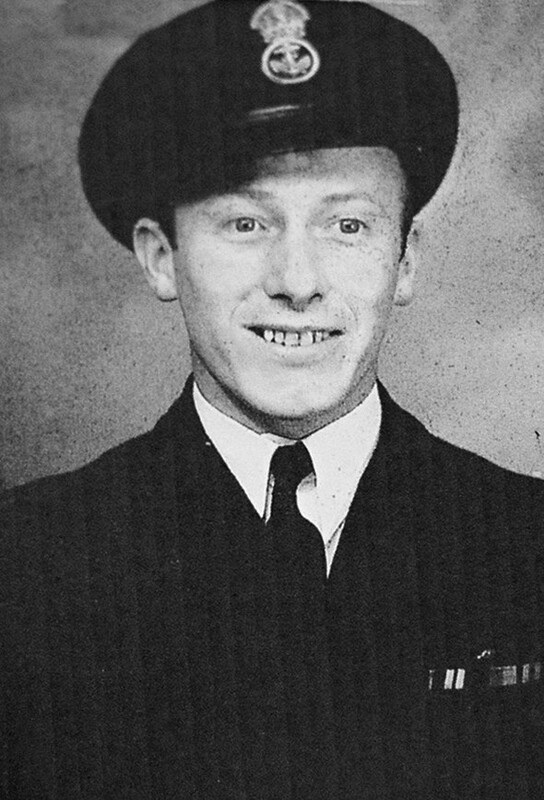 John returned to London and was on embarkation leave for Burma when Victory in Japan was announced. “I was on the Edgware Road and remember there was some sort of party going on. We knew the bomb had been dropped on Japan but I was still expecting to be shipped out to the Far East as the war was still going on there. 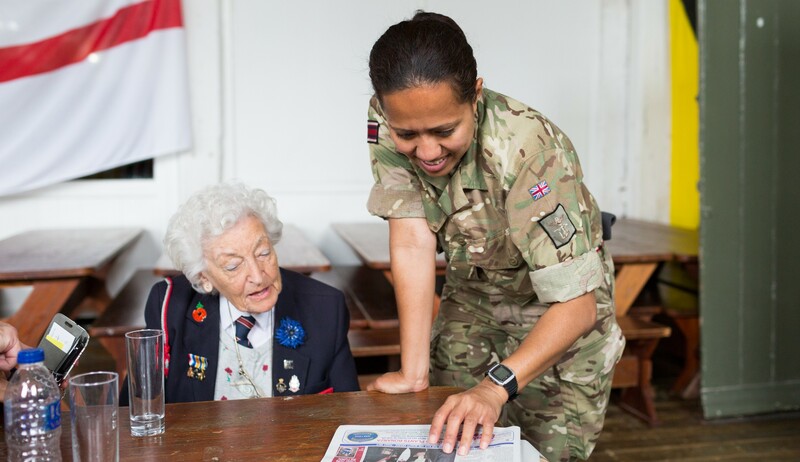 A young woman came running up to me in the street and threw her arms around me, shouting the war’s over!‘. “Well we didn’t have the detailed awareness that people have these days. Most everything was done in secret, so we didn’t have any tactical understanding of what was going on at the time. It wasn’t a great crusade; we were doing the job we’d been trained for. Having said that, on the day of the landings we all knew we were involved in something big. We were back in Europe; we were advancing and we were winning. It had to be done; Germany had to be stopped. 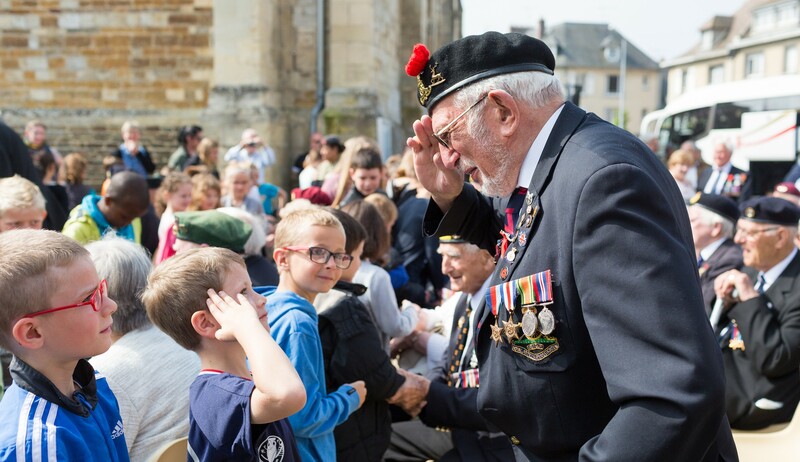 It was in 2009 when we first met John and his partner Beryl and had the pleasure of traveling to Normandy in their company. 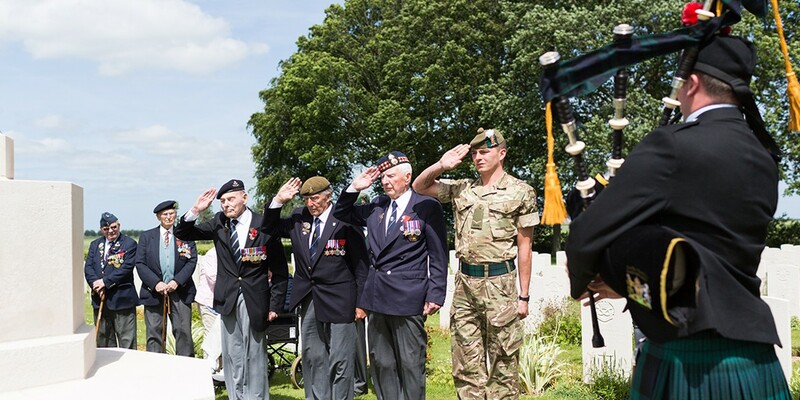 They returned with D-Day Revisited 7 times and became very dear friends. John passed away very peacefully at home after a short illness in April 2016. He was 95 years young. John was a member of our charity committee and Beryl continues to volunteer her time to help with the arrangements for our annual pilgrimages.